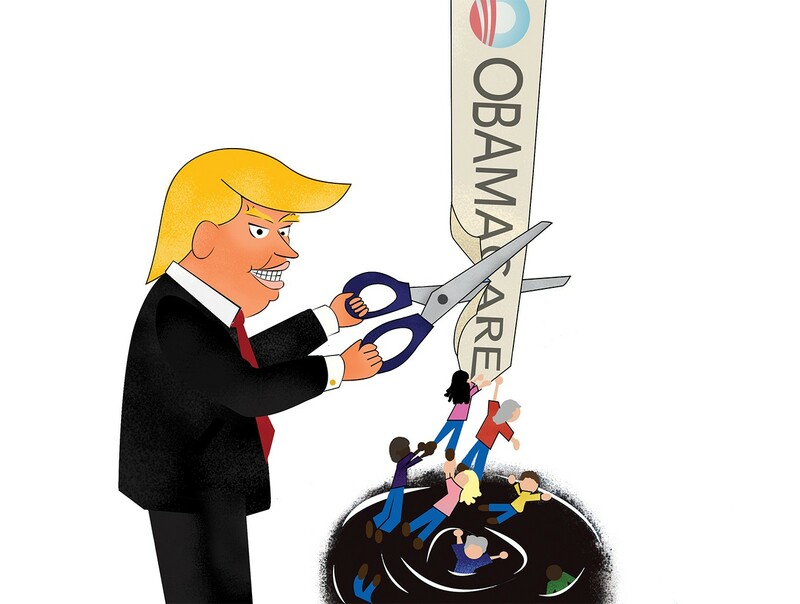 Millions of Americans found health care through the Affordable Care Act, including more than 150,000 in Alameda County — and many now fear that they will lose it once President Trump officially slashes “Obamacare.” To make matters worse, the Republicans have yet to settle on a replacement plan, which has patients with pre-existing conditions on tenterhooks — including Bonnie Smith, who works as a tutor in Oakland and has no health insurance through her job. Before the ACA passed in 2010, Smith (the Express is using a pseudonym to protect her privacy) relied on a free clinic in San Leandro for her diabetes treatment. And accessing care at that clinic was no easy feat. With Covered California, she acquired a regular doctor, as well as care in a specialty clinic. But she’s worried that, once the ACA is repealed, she and others won’t be eligible for insurance, because “we’ve disclosed all our pre-existing conditions,” she explained. “It’s not like we can sweep them back under the rug. They’re in our medical records. So, if we lose the provision on pre-existing conditions, a lot of us are screwed,” she said. Smith described the uncertainty as stressful — which is amplified by the fact that the Trump administration doesn’t yet have a backup plan in the wings. “If you knew when you got into office you were going to repeal Obamacare, why didn’t you have a plan ready to go?” she asked. Specifically, more than half of the states that chose to accept federal money to expand Medicaid are now under Republican governorships, which makes it politically tricky for the GOP to pull back on Medicaid expansion. Yet the Medicaid Expansion program, or MCE, will likely take the first hit when the ACA is gutted, according to Rebecca Gebhart, interim director the Alameda County Health Services Agency. The MCE brought medical coverage to more than 100,000 people in Alameda County alone. “The county spent five years staffing up and building up to accommodate the increased patient load,” Gebhart explained. Now, if the MCE program is cut, patients will still use clinics, emergency rooms, and hospitals — but the providers won’t be reimbursed. “It will be a complete disaster,” Gebhart said. Data from the Kaiser Family Foundation show that 26 percent of California residents are on either Medicaid or the Childrens Health Insurance Program. MediCal funds not only reimburse providers, but they also contribute significantly to the state’s economy, so there would be a ripple effect via lost jobs and spending. Chan explained that, with the proposed new block grants, “the devil’s in the details.” She says we need to know more on the size of the grant, and whether it’s based on population, and what happens if only some states want to accept the grants. Meanwhile, the Trump administration appears to want to have its cake (by cutting “Obamacare”) and eat it, too (by permitting kids to stay on parents’ employer-based insurance until age 26 and retaining the pre-existing conditions clause — both popular features of the ACA). College students such as those at UC Berkeley will be covered regardless of changes in the ACA, according to Kim Lapean, communications manager at the University Health Center. The UC system’s Student Health Insurance Plan, or SHIP, program is “better than platinum” ACA coverage, she said, and it includes vision and dental care, as well as the standard medical coverage. Some UC students complain, however, that getting kicked off their parents’ plan and paying for school coverage will be a lot more expensive — $1,306 per semester for undergraduates, and $2,073 per semester for graduate students (although many grad students get those costs covered). That said, UC Berkeley is the only college in the area that offers a health-care plan of any sort. The Peralta Community Colleges and Cal State East Bay have a few student health services on their campuses, but no health insurance plan. As for the pre-existing conditions clause, prior to the ACA, more than 52 million Americans had pre-existing conditions that made them uninsurable, according to a Kaiser Family Foundation study. Gebhart said that problem in keeping just the 26-year-old and pre-existing conditions aspects of “Obamacare” is that insurance is made affordable by the individual mandate (i.e., the ACA rule that all individuals must obtain health insurance). And without a mandate, the other pieces don’t work. “It’s the backbone of Obamacare, and the Republicans want to repeal it,” she explained. Without subsidized premiums under the ACA, low-income Californians would not be able to buy insurance on the state exchange. Gebhart noted that “64,000 Alameda County residents are enrolled in Covered California.” Their insurance coverage will be unchanged for the rest of 2017 — but, again, the future is in limbo. If the ACA disappears, some former low-income recipients may become eligible for HealthPAC, a county program that covers some of the uninsured. But “others will simply show up in hospital emergency rooms,” Gebhart said — costing the public and private sectors hundreds of millions of dollars. Some immigrants in the Bay Area are so worried about President Trump’s forthcoming immigration policy, however, that they’re opting out of federally funded health-care coverage such as MediCal anyway, both Gebhart and Chan confirmed. Gebhart told the Express that she’s heard Trump’s order might try to force governments to turn over patient Medicaid data to Immigration and Customs Enforcement. Because of this, “some [patients] are trying to disenroll from MediCal, because other family members are undocumented,” she explained. The county has responded by putting up posters in its clinics, advising patients that they will continue to see everyone, regardless of immigration status. Chan also confirmed that she’s heard a similar rumor of an upcoming “public charge” order, which would subject any non-citizen who uses public benefits to deportation. Amid this uncertainty, insurance companies have a deadline to submit their applications for the 2018 ACA marketplace by May 3 of this year. Some are exiting the markets. Others are hedging their bets by raising premiums even higher. As a solution, some Republicans have suggested returning to high-risk pools as a way of insuring people with pre-existing health problems. In the past, these insurance instruments had partial public funding, but were said to be fraught with problems, including costly premiums and long waiting lists. Many could never afford the premiums, while others even died while waiting for coverage. Republicans have also suggested health-savings accounts, which offer tax advantages to those with high incomes, but have not benefitted the rest of the population. Chan rejected both of these solutions. “Health-savings accounts don’t work; people went to the hospital and found out all this stuff wasn’t covered,” she explained. As to high-risk pools, she said “very few people could afford them.” She dismissed the GOP’s health-care solutions as unworkable for millions of people. Alice Feller is a news and investigations intern with the Express. She’s also a journalism student at Laney College and former managing editor of the award-winning Laney Tower. Feller is also a practicing physician in the East Bay. We fought back with humor, even silliness, at the march.